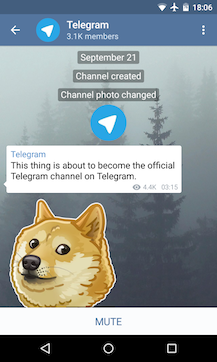 Just after announcing it is now seeing 12 billion messages per day (a 12-fold increase since February), messaging app Telegram has introduced yet another feature to differentiate itself from its competitors. As of today, Broadcast lists have been replaced with Channels—a new and improved version of the traditional broadcast. 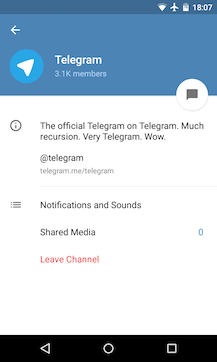 The addition of Channels is the only change in v3.2 of Telegram, but it's a big improvement. A Channel can have an unlimited number of members, up from 100 for Broadcast lists. 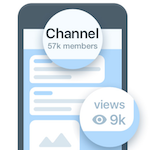 Channels also include view counters for each message, permanent URLs that allow anyone to join, and the ability for members of a Channel to forward messages to other users. All you need now is a way to reply to Channel messages and you've basically got yourself a Twitter clone inside Telegram. A hotfix update (v3.2.1) was released shortly after Channels was added. What did it fix? Froyo stuff. Can't leave Froyo users twisting in the wind. Here's the changelog. 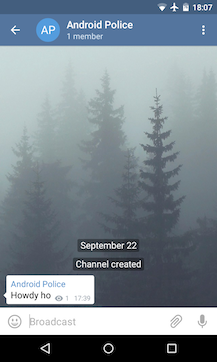 Introducing Channels – a great new way to broadcast your messages to unlimited audiences (replaces old Broadcasts). The iOS version has also received an improved Photo Editor, with tools to adjust an image's tint, fade, and curves. There's no word yet on when Android will get those features, but hopefully it won't be too long.